Conservation practices such as sustainable soil management (SSM) and no-tillage may increase production and productivity, which may help reduce food insecurity in household levels. Koirala et al. 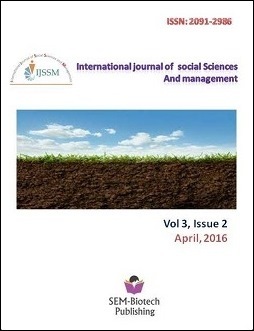 (2014) showed that the SSM practices have a high positive impact on food security and income in Ramechhap, Nepal. However, the impact of the SSM practices on food security and income were highly overestimated. Further, they did not explain how the impact of other factors on household food security and income are held constant to evaluate the impact of the SSM practices. This paper argues that the estimate of the impact of SSM practices on food security by Koirala et al. (2014) is highly upward biased due to the same unobserved factors affecting participation on the SSM practices and food security. This study shows an alternative method: an endogenous treatment effects model, which correctly estimates the impact of the SSM practices on food security. In addition, some issues that may affect food security and income measures associating with data collection are discussed.